In honor of Earth Day, we have a fun poster for your classroom! Help students visualize and learn about some of the amazing creatures that inhabit our planet with this free downloadable. Designed for your littlest learners, this fun packet features Sandy the Seal and includes a coloring page, connect the dots activity, and picturing activity. 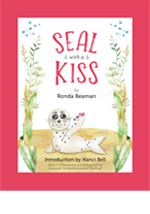 Seal with a Kiss is a children's book that follows the Visualizing and Verbalizing process. The high-imagery story has a sweet and important message for each reader or listener. This sample chapter paints a picture of America's "Great Melting Pot" when waves of immigrants were trying to start new lives in the U.S. The Imagine History series is written to develop the imagery-language connection for American history. It can be used specifically with the steps of the Visualizing and Verbalizing program or as a stand-alone resource. This book is written at a 5th grade level. This sample chapter helps students to visualize and understand the important process that led to the drafting of the U.S. Constitution. 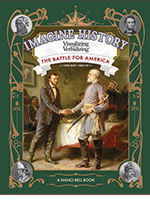 The Imagine History Series is written to develop the imagery-language connection for American history. This sample chapter takes students on a journey through imagery to meet Aztecs, pioneers, and President Lincoln. 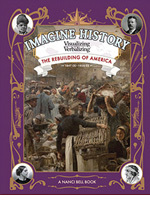 The Imagine History series is written to develop the imagery-language connection for American history. It can be used specifically with the steps of the Visualizing and Verbalizing program or as a stand-alone resource. This book is written at a 5th grade level. Experience the richness of history with imagery to better comprehend it and embed it into memory! This sample chapter from Imagine History: The Discovery of America takes students on a journey through imagery to meet the first Americans. This groundbreaking book can be used specifically with the steps of the Visualizing and Verbalizing program or as a stand-alone resource. Most applicable for grades 3 and above. 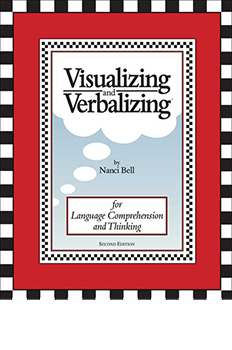 The Visualizing and Verbalizing® program develops concept imagery—the ability to create an imaged gestalt from language—as a basis for comprehension and critical thinking. Download our sample chapter to explore how the development of concept imagery improves reading and listening comprehension, memory, oral vocabulary, critical thinking, and writing. Download our sample chapter to explore how The Seeing Stars® program develops symbol imagery—the ability to visualize sounds and letters in words—as a basis for orthographic awareness, phonemic awareness, word attack, word recognition, spelling, and contextual reading fluency. Dowload our sample chapter to explore how the Talkies® program is the primer to the Visualizing and Verbalizing program for students who need simpler, smaller steps of instruction to establish the imagery-language connection. The On Cloud Nine® (OCN) program develops the ability to image and verbalize the concepts and processes of math. Download our sample chapter to explore how concept imagery and numeral imagery are integrated with language to improve both mathematical reasoning and mathematical computation. Download for free: Seeing Stars Coloring Pack #3 features five Star Words coloring pages, with hilarious Ivan the Cat pictures. Download for free: Seeing Stars Coloring Pack #2 features five Star Words coloring pages, with hilarious Ivan the Cat pictures. Download for free: Seeing Stars Coloring Pack #1 features five Star Words coloring pages, with hilarious Ivan the Cat pictures.